Herman Cain debated Newt in a long format one on one and came out OK, so what is the problem Mitt? Aren’t the American people deserving of a long format conversation that isn’t just cute 30 second responses? Mitt is trying to run out the clock and hope for a win without really fighting for it. We all know Mitt’s past and we all know Gingrich’s. Both candidates in the past have had some foolish positions. The difference is not just some of the foolish positions that have come out of their mouths, but what they have actually implemented into law. Mitt has the RomneyCare albatross around his neck which is too similar to ObamaCare. Gingrich talked about a health insurance mandate as a part of a thought experiment with a think tank and rejected the idea after a time because he concluded that a government powerful enough to impose such a mandate would also be a heavy handed disaster. Romney actually imposed a mandate. Both candidates say they are pro-life now, but as a matter of legislation only one has signed laws that have taxpayers pay for abortions and that is Mitt Romney. Newt Gingrich has actually balanced the US budget, reformed entitlements and welfare into better working programs and Newt helped draft the Medicare Part D which came in 40% under budget. Newt blabs a lot, he is an academic and 50 odd sounding ideas will come out of his mouth every day, Newt’s mouth and academic way of thinking makes Newt his own worst enemy, but when you look at what laws were passed and how budgets were balanced Newt gets the job done and knows how to nationalize elections and get the American people behind an agenda he has sold on the merit. What has Mitt Romney actually DONE to advance the conservative movement or even protect traditional Americanism? Newt has said a lot of things that are just dumb or were unfairly demagogued and lied about, but Newt admits these mistakes and does not sugar coat them. Mitt Romney lies about his. I have not caught Newt in a fib in any of the debates. I cannot say the same about Romney. Newt is not afraid of the media and will take them on when needed, this is critically important to both the election and the fourth estate as a check and balance. The elite media is supposed to be helping keep government in check and instead most of what we get from them is cheer-leading for a leviathan state. Newt Gingrich has been plugging away against Obama’s bad policies since 2009 and has been defending us in the elite media since Obama took office. Newt defended Sarah Palin as the press trashed her when we now know that on issue after issue after issue from death Panels, to ObamaCare costs, to the cronyism, to energy policy, to Egypt & Libya, to inflation and the increasing food problem that Palin has been almost prophetic in her correctness. Where was Mitt Romney in 2009 and 2010 when you and I were out protesting in the cold, raising awareness, networking to educate people, and raising funds for local candidates? When history looks at who advanced the conservative movement the most Newt comes in second only to Ronald Reagan. Newt is featured in almost every political science textbook for his achievements. Newt’s name will always be remembered along the names of Reagan, Taft, Coolidge and Goldwater. 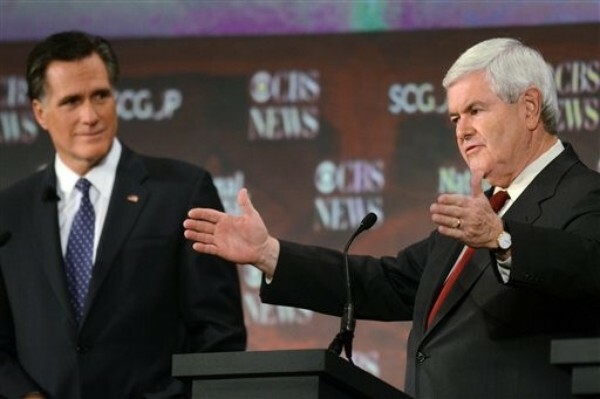 If this does end up as a race between Newt and Mitt, the choice of who to endorse is obvious. This entry was posted in 2012 Primary, Coolidge, Lies, Mitt Romney, Newt, Obama, Reagan, Sarah. Bookmark the permalink.